Championship week didn’t change the top two spots on the AP top 25 rankings, with LSU obviously remaining at number 1 after their 42-10 win over Georgia in the SEC Championship game. Alabama, despite remaining idle, still lead Oklahoma State. The Cowboys sealed their first ever Big 12 title after beating Oklahoma for the first time since 2002 in the Bedlam series. Only enough for number 3 in the rankings. 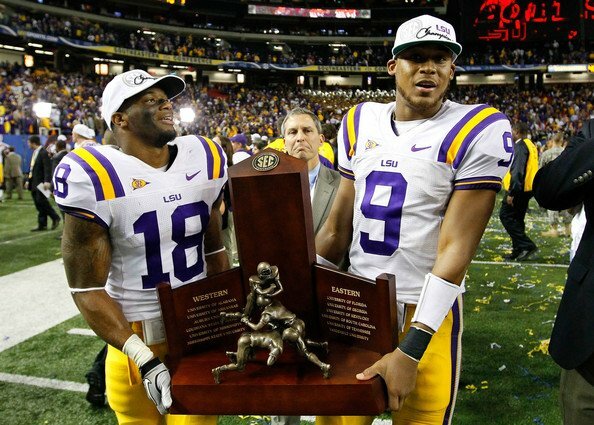 It’s not over yet, with the BCS final rankings coming soon, deciding who will play LSU for the national title. It should be Oklahoma State, but today’s starting off bad for Mike Gundy and his players. The rest of the BCS and other bowls will be determined via the final rankings as well. 1. LSU Tigers, 13-0 (60 First Place Votes) – Sealed their first SEC title since 2007 with a 42-10 win over Georgia in Atlanta despite having a terrible start once again. Undoubtly deserve to be the number one team in the country. Hard to see who can beat them. 2. Alabama Crimson Tide, 11-1 – Didn’t play this week, didn’t play for their conference championship after finishing behind LSU in the SEC West. Will probably play for the national title for a second time in three years. 3. Oklahoma State Cowboys, 11-1 – Didn’t move as well in the AP rankings despite beating Oklahoma in Bedlam for the first time since 2002, a 44-10 destruction to give Mike Gundy his first Big 12 Championship. Probably not enough for a BCS title shot. 4. Stanford Cardinal, 11-1 – Didn’t play for the Pac-12 title, rested this week, stayed at the same spot. 5. USC Trojans, 10-2 – Didn’t play and still made a four spot climb. Won’t play in any bowl game anyway. 6. Oregon Ducks, 11-2 – Beat UCLA 49-31 with LaMichael James running for 219 yards and three touchdowns. It was their third straight conference title in the first ever Pac-12 championship game. Still finished behind Stanford and USC though, climbing two spots. 7. Arkansas Razorbacks, 10-2 – Didn’t play, fell a spot. 8. Boise State, 11-1 – Moved up a spot after beating New Mexico 45-0 with another fine performance from Kellen Moore. 9. Wisconsin Badgers, 11-2 – Beat Michigan State 42-39 after Montee Ball ran for 137 yards and scored four touchdowns (3 rushing, 1 receiving), winning their second straight conference title in the first ever Big Ten championship game. It’ll be a second straight Rose Bowl trip for the Badgers after losing to TCU last year. 10. South Carolina Gamecocks, 10-2 – Didn’t play while their inner state rivals won the ACC, and still managed to move up four spots. 11. Kansas State Wildcats, 10-2 – A hard earned 30-23 win over Iowa State as Bill Snyder reached 10 wins for the first time since 2003. 12. Michigan State Spartans, 10-3 – Lost to Wisconsin 39-42 in a huge Big Ten Championship game despite leading deep into the fourth quarter, falling a spot. 13. Michigan Wolverines, 10-2 – Didn’t play, moved up four spots. 14. Clemson Tigers, 10-3 – Surprised many by beating Virginia Tech (again), ripping the Hokies 38-10 to win the ACC Championship game and their first conference title since 1991! 15. Baylor Bears, 9-3 – Robert Griffin III had another huge day in Waco with two passing touchdowns and two through his legs as Baylor beat Texas 48-24 with Art Briles leading the Bears to their second straight Bowl birth, something that hasn’t happened since 1992. 16. TCU Horned Frogs, 10-2 – Winner’s of the Rose Bowl last year are still hoping for the at-large BCS spot after beating UNLV 56-9. 17. Virginia Tech Hokies, 11-2 – Lost to Clemson for the second time this season, this time in the ACC Championship game, an event they usually own. Fell 12 spots from last week. 18. Georgia Bulldogs, 10-3 – Missed a chance to really mess up the BCS rankings, losing 42-10 to LSU in the SEC Championship game, falling six spots in the AP rankings. 19. Oklahoma Sooners, 9-3 – A very disappointing finish to a disappointing season, losing to Oklahoma State 44-10, the first loss to the Cowboys since 2002. 20. Houston Cougars, 12-1 – A dream season ending in a loss to Southern Miss in the Conference USA championship game, ending the Cougars’ hopes of a BCS game. Fell 13 spots after the 49-28 stunner. 21. Nebraska Cornhuskers, 9-3 – Didn’t play, fell a spot. 22. Southern Miss Golden Eagles, 11-2 – Stunned Houston and Case Keenum with a 49-28 win to grab the Conference USA title, winning the conference title for the first time since 2003. 23. West Virginia Mountaineers, 9-3 – Beat South Florida 30-27 to earn a share of the Big East title, and will probably win the conference’s BCS spot. 24. Penn State Nittany Lions, 9-3 – Didn’t get to play. 25. Florida Gators, 8-4 – Didn’t play, stayed at #25.